Tomorrow marks the beginning of the world-famous SEMA Show. Over the last 50 years, this show- located in the heart of Las Vegas- has grown into one of today’s largest and most anticipated annual auto events. 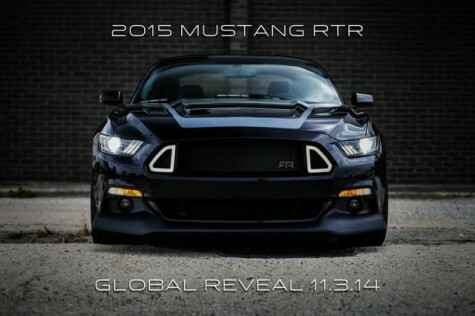 “[It’s] where automakers and tuners roll out some of their gaudiest wares. It’s a feast for the senses- especially if you like huge wheels, crazy paint jobs and over-the-top performance,” says Greg Migliore of Autoblog. Well, hell, that’s what 4wheelonline is all about! That’s why we’ve sent a large crew of representatives to cover the event and bring back some of the world’s most innovative and mind boggling upgrades. Over the next week, you guys can expect pictures, videos, and interviews with some of today’s largest names and some of the events wildest concepts. In order to add a little flavor to their transit line-up, Ford is planning on displaying 5 different pimped out transit vans. One of the more anticipated vans will be the 3D carbon transit van. According to reports, this bad boy will feature a quartet of reclining throne like seats that have cooling, heating, and massaging capabilities. There will also be a solid hickory floor, a 50-inch high def TV, custom air dam, fog lights, side and rear skirts, and 20-inch wheels. This truck is designed to be a bar on wheels. It features a mahogany shell and flip-top roof and is capable of carrying four half-barrel beer kegs. In preparation for the insanity it could produce, the vehicle has been designed to allow drivers the option of hosing out the interior. Powering this tailgater’s dreamboat is a V-8 engine that cranks out 420 horsepower. Drink up!! There are a pair different vehicles coming from Scion that are getting people talking. 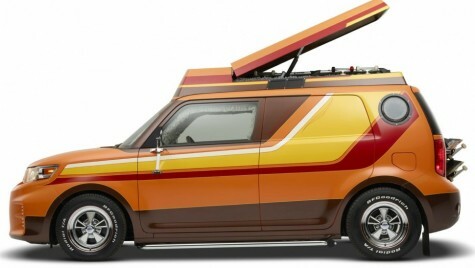 The first vehicle is the Scion x Riley Hawk Skate Tour xB. This vehicle features a brown-on-brown interior, shag carpeting, and porthole side windows. Additionally, it has a pop-up camper top in case you and your girl want to look up at the sky in between secluded bang sessions. The second highly anticipated vehicle coming from Scion is the Scion FR-S T1. This vehicle is a definite attempt by Scion to up their styling a level and compete with some of today’s better looking models. Stephen Edelstein of Digital Trends says, “The top attraction at Scion’s 2014 SEMA booth will probably be the FR-S T1, which features a targa-style roof. Toyota’s youth brand might have been envisioning a poor man’s Porsche 911 Traga, but the T1 seems a bit more Smokey and the Bandit. Those rear window slats look like they belong on a 1970s Firebird, Camaro, or Mustang.” According to reports, the vehicle will also feature custom 19-inch wheels, lowered suspension, and an upgraded turbocharger. Teaming up with motocross legend Ricky Carmichael, Chevy is amping up their Colorado to showcase all of its performance upgrade capabilities for motorcycle and bike enthusiasts. This truck will feature a concept sport bar in the bed to help secure any bikes, a CornerStep rear bumper to help load and unload, and 17-inch Z71 aluminum wheels to help with off-road performance. 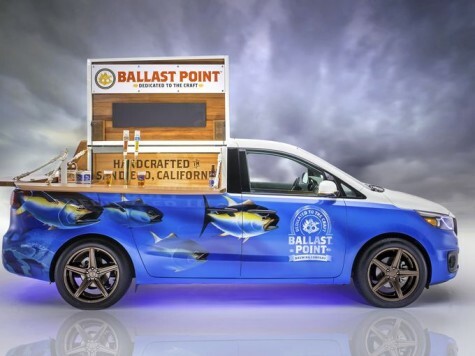 This entry was posted in Culture and tagged 2015 Mustang RTR, auto show, Ballast Point Sedona, Chevy Colorado Performance Concept, Commemorative Camaro, Ford Transit Van, Kia Beer Van, News, Scion FR-S T1, Scion x Riley Hawk Skate Tour xB, SEMA. Bookmark the permalink.